The idea of the building a clothesline came up while my husband and I were discussing more ways to cut back on the energy bill, short of lighting candles at night and going to bed at dark. We both grew up in homes which used a clothesline. Knowing what an energy hog an electric clothes dryers is, building a clothesline was the first thing we thought to do. Faster in the summer. You can finish laundry quicker. Building a clothesline is a one day project except for waiting on the concrete to dry when you set your posts into the ground. Select your location. Choose a sunny spot preferably without trees. We have a lot of trees in our yard so we selected a location with the least amount of shade between trees. It also needed to be out of the way, near out fence line to leave the back yard free for the kids to play. Determine the distance you want between poles. Dig the holes for the posts to be set into. Do not set the posts just yet. 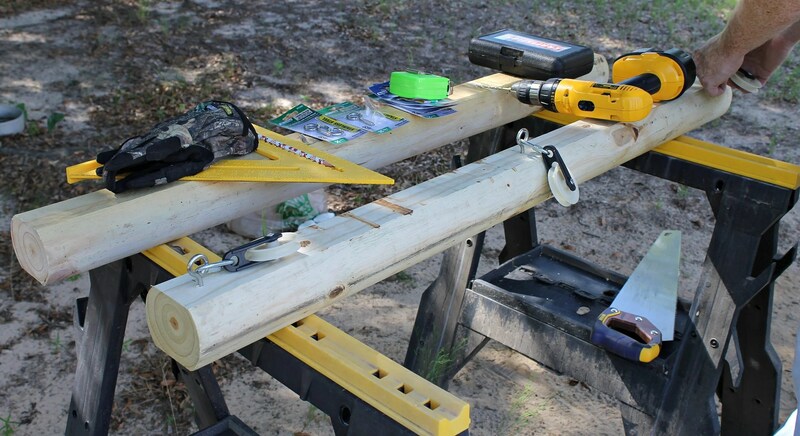 Cut one of the 8 ft. timbers in half creating two 4 ft. posts. These will become the “T” which will attach to the two other timbers. 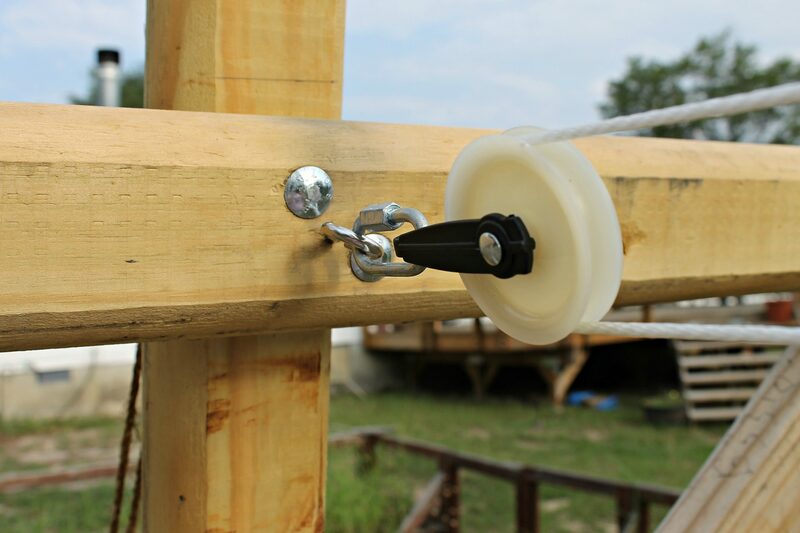 Install the clothesline pulley’s onto the two 4 ft. “T” posts you cut. Be sure to measure your desired distance between pulley’s. This task is easier done while still using your work bench which in our case was a couple of saw horses set up in the yard. Create a notch in both of the remaining 8 ft. timbers for the ‘T’ will fit into. 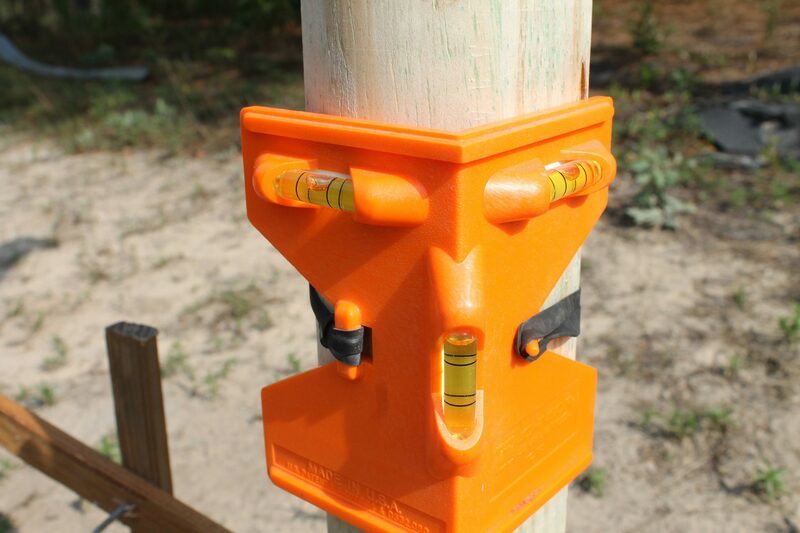 Measure your desired distance down the post where you will cut a notch (see picture below). This notch helps to secure a better fit when you attach the “T” post. 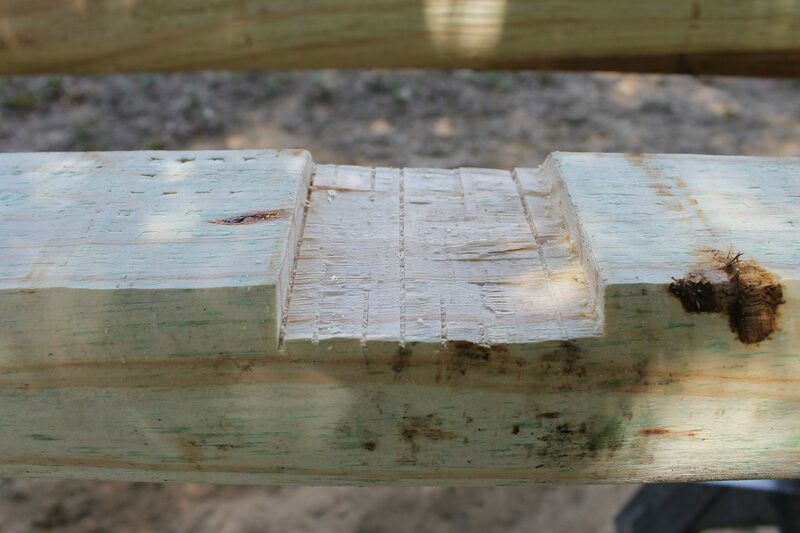 My husband did this step using a hammer and a chisel. 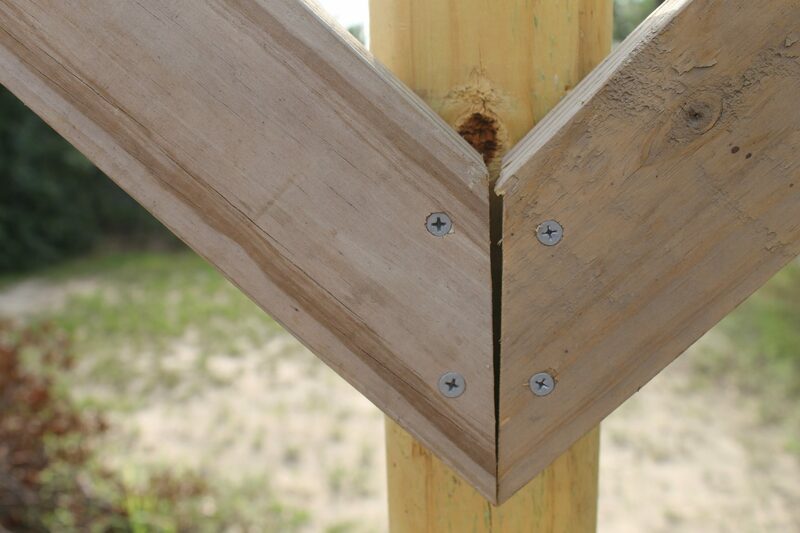 Using the 2 x 4’s, cut to fit, attach as bracing boards using screws. It is time to set posts into the hole the desired depth. I am a whopping 5 ft. 0″ tall. My sweet husband had me stand in the location we selected and raise my arms up as high as I would be able to comfortably hang clothes on the line. The cure for keeping long things from touching the ground is to drape them over the line double so they don’t drag the ground. The clothesline will be completely useless to me is I couldn’t reach it to hang the clothes out. Nail a few wooden stakes on to brace the post prior to adding the Quikrete into the hole. Once you have your post braced up and it is level, go ahead and prepare the Quikrete according to package directions. Add the concrete carefully so your post remains level. The concrete may take up to 2 days to set up. Do not add the clothesline until after the concrete has set up. String the Clothesline. Those Line tighteners were wonderful because a clothesline will begin to sag a bit from time to time and those allow quick tightening. You may have noticed what appears to be an upside down can on the top of the clothesline posts. Those are placed there to prevent rain from rotting the posts. It’s a nice trick. Oh gosh, I haven’t used a clothesline since we left Hawaii over 10+ years. I remember hanging laundry outside of my grandmother’s house each week as it was one of my chores 🙂 It’s something I missed when we moved to Cali. I wish I had room in my backyard for this because I would love to be able to dry my clothes outside! Great DIY! Thanks so much for sharing this for Maker’s Mix Up this week! This looks so neat! You really did a great job here! There are few things better in life than the smell of sheets dried in the sunshine! Thanks for sharing on Show-Licious! You are so right Ashley. It’s the little things in life that mean the most! I remember having a clothesline when I was growing up… I loved the smell of sun dried clothes! Those fresh smelling clean clothes, sheets and towels are really nice. That savings on the energy bill is even nicer 🙂 Thanks for stopping by Allison! Growing up in deepest darkest Arkansas my Granny used a clothesline. There is nothing like the smell of a wind dried blanket or sweater, The smell is just comforting. I can smell the fresh sheets already! Nice! I’ve never used a clothesline! But I’ll bet the clothes smell way fresher on the line than they do in the dryer! Clothes lines are so practice and remind me of my southern grandmother. She had a clothes line and oh did we have to hang and GET the clothes for the house. Sweet memories. Wow that is a really awesome clothes line! I don’t have one, but you never know when your dryer will quit on you! Also, It may be a good idea to make one for the clothes that can’t go in the dryer. Thanks Logan. We have cut back on our energy bill by using the clothes line. Score! Gosh, you took me way, way back! I remember helping my mom hang out clothes when I was growing up. I loved it! Then I remember the day mom bought her very first clothes dryer. I think I was about 9 years old. Fast forward to when I first got married and the first house we lived in had a clothes line and I used it all the time, especially after the babies started coming and at that time I used cloth diapers. I haven’t used a clothes line in years, but while reading your post I could almost smell that fresh scent that only comes from clothes that were dried on the line. (Also the song, “Suds in the Bucket and the Clothes Hanging out on the Line” just came to mind!) Pinning!